An Afghan rights activist has used a human rights forum to warn that despite the ousting of the hardline Taleban, women in Afghanistan are still suffering discrimination on a grand scale. Contrary to what the world seems to believe, lifting the burqa has not eliminated the oppression, said Mariam Rawi of the Revolutionary Association of the Women of Afghanistan (RAWA). 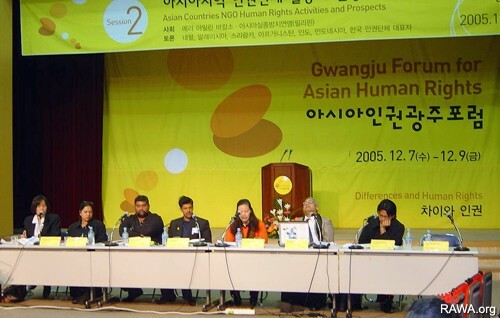 She was speaking at last week's Kwangju Forum for Asian Human Rights in South Korea. "The foreigners were not allowed to go outside of Kabul - if it is not safe for them to go, how unsafe the situation must be for the locals? "With the burqa removed, everybody seemed to believe all the issues Afghan women were facing were suddenly finished. But the depth of the tragedy and misery of the women remains intact." Ms Rawi said women in Afghanistan continue to be plagued by discrimination in every facet of life. Many are still not allowed to leave home or talk to men outside the family and are targeted by Islamic fundamentalist warlords who dominate many provinces. Forced marriages of young girls to elderly men continue. Violence against women remains a serious problem, and victims of domestic violence dare not seek police assistance for fear they will be raped or beaten by officers, she said. "People of the world should know that in the so-called 'liberated' Afghanistan, Afghan women are still suffering harshly," she said, citing the case of Amina, an Afghan woman stoned to death under a local court decree in northern Afghanistan in April this year. "One elderly government official wanted to take a nine-year-old schoolgirl as his third wife, because his other two wives were uneducated and he wanted a literate wife." In August, an 18-year-old girl was reportedly arrested in Herat province for running away with her boyfriend and was gang raped by officers at the police station. None of the cases documented by RAWA have been taken to court. "The majority of women in Afghanistan are not happy - statistics show more than 95 per cent of the women have depression problems. Every 30 minutes, a woman dies in pregnancy, childbirth or from other gynaecological problems." Ms Rawi said RAWA's main weapon against Islamic fundamentalist oppression was education. About 86 per cent of women in Afghanistan are illiterate. "The men and women, particularly in rural areas, are ignorant and do not know the value of education. Women truly believe they were born only to serve their fathers, husbands and sons. "Afghanistan has gone from one hell to another, from the Soviet repression to the dark period under the mujahedeen to the Taleban. "The same fundamentalist leaders responsible for crimes under the mujahedeen have changed their clothes and their talk and are now in government."